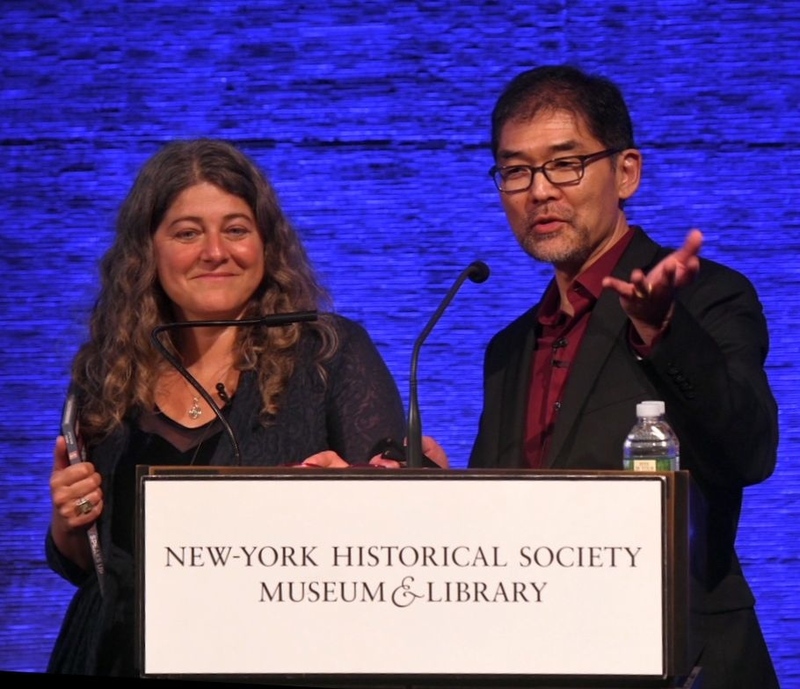 “Fred Korematsu Speaks Up” co-authors Laura Atkins and Stan Yogi accept the Children’s History Book Prize from the New-York Historical Society. “Fred Korematsu Speaks Up” (2017, Heyday Books) by Laura Atkins and‎ Stan Yogi has recently been selected for three honors for history books for young readers. Dr. Louise Mirrer, president and CEO of the New-York Historical Society, announced May 8 that Atkins and Yogi will receive the $10,000 Children’s History Book Prize, which is annually awarded to the best American history book for middle readers ages 9–12, fiction or non-fiction. This year’s award was scheduled to be presented by Justice Robert Katzmann, 2nd Circuit Court judge and founder of the Immigration Justice League, on May 16 at the New-York Historical Society’s Robert H. Smith Auditorium. “‘Fred Korematsu Speaks Up’ masterfully tells the story of the incarceration of Japanese Americans during World War II through the lens of one person’s life and challenges,” said Mirrer. “The civil rights issues explored in this book continue to resonate today, especially for us at New-York Historical as we help green card holders learn about civics and American history through our Citizenship Project. “Fred Korematsu Speaks Up,” illustrated by Yutaka Houlette, tells the story of Fred Korematsu, a young Japanese American who defied U.S. governmental orders by refusing to report to prison camps during World War II, which set in motion a landmark Supreme Court case. With its poetry, historical text, primary source documents, and illustrations, the book allows readers to engage with his story in an immediate and absorbing way. In addition to the prize ceremony, Atkins and Yogi will join families at New York- Historical on May 20 for DiMenna Children’s History Museum’s Reading into History Family Book Club. The authors will answer young readers’ questions about Fred “Korematsu Speaks Up,” followed by a chance for families to visit the galleries to explore artifacts related to the book. The event is free with museum admission. “Fred Korematsu Speaks Up” is available for purchase from the NYHistory Store as well as other retailers. The book prize was selected by a jury comprising librarians, educators, historians, and families of middle-schoolers. For the second year, an online poll invited the public to cast a vote for their favorite as well. Finalists for the Children’s History Book Prize included “Lucky Broken Girl” by Ruth Behar, “This Is Just a Test” by Wendy Wan-Long Shang and Madelyn Rosenberg, and “Undefeated: Jim Thorpe and the Carlisle Indian School Football Team” by Steve Sheinkin. Since 1953, the Jane Addams Children’s Book Award has annually recognized children’s books of literary and aesthetic excellence that effectively engage children in thinking about peace, social justice, global community, and equity for all people. Recipients of the 2018 awards were announced on April 30 by the Jane Addams Peace Association. The winner in the Books for Older Children category is “The Enemy: Detroit 1954” by Sara Holbrook. “Fred Korematsu Speaks Up” is one of three Honor Books named in the category. The book “reveals the depth and scope of anti-immigrant discrimination in a particularly bleak period of U.S. history,” the association said. “A fusion of free-verse poetry, Japanese American artwork, short narratives, timelines, and historical photographs tells the story of Fred Korematsu and his family … Placing the family’s experience within a continuing history of discrimination against many groups in the United States, the varied primary source documents highlight Japanese American creative talents and contributions. The other two Honor Books are “Piecing Me Together” by Renee Watson and “Midnight Without a Moon” by Linda Williams Jackson. The winner in the Books for Younger Children category is “Malala’s Magic Pencil” by Malala Yousafzai. The Honor Book in the category is “Before She Was Harriet” by Lesa Cline-Ransome. A national committee chooses winners and honor books. Regional reading and discussion groups of all ages participated with many of the committee members throughout the jury’s evaluation and selection process. The 2018 Jane Addams Children’s Book Awards will be presented on Oct. 19 in New York City. The National Council for the Social Studies established the Carter G. Woodson Book Awards for the most distinguished books appropriate for young readers that depict ethnicity in the United States. First presented in 1974, this award is intended to “encourage the writing, publishing, and dissemination of outstanding social studies books for young readers that treat topics related to ethnic minorities and race relations sensitively and accurately.” Books relating to ethnic minorities and the authors of such books rarely receive the recognition they merit from professional organizations. By sponsoring the Carter G. Woodson Awards, NCSS gives wide recognition to and encourages these authors and publishers. “Fred Korematsu Speaks Up” is the Middle Level winner. The honoree in the category is “Schomburg: The Man Who Built a Library” by Carole Boston Weatherford. The Elementary Level winner is “The Youngest Marcher: The Story of Audrey Faye Hendricks, a Young Civil Rights Activist” by Cynthia Levinson. The honoree in the category is “Martin’s Dream Day” by Kitty Kelley. The Secondary Level winner is “Twelve Days in May: Freedom Ride 1961” by Larry Dane Brimner. The honoree in the category is “Now or Never! 54th Massachusetts Infantry’s War to End Slavery” by Ray Anthony Shepard. The awards ceremony will take place at the 98th annual NCSS National Conference, to be held from Nov. 30 to Dec. 2 at the Hyatt Regency in Chicago. Laura Atkins is an independent children’s book author and editor who has worked in the children’s book field for more than 20 years — seven years in editorial departments at children’s publishers in the U.S. (with a focus on multicultural children’s books) and then as a freelance children’s book author, editor, and teacher. She has helped to produce winners of the Coretta Scott King Award and American Library Association Notable Book selections, among others, and is a lecturer at the National Centre for Research in Children’s Literature at Roehampton University in London. Based in Berkeley, she has an MA in children’s literature from Roehampton University and an MFA in writing for children and young adults from Vermont College of Fine Arts. She is the author of the picture book “Sled Dog Dachshund” (Minted Prose, 2016). Stan Yogi is the co-author, with Elaine Elinson, of “Wherever There’s a Fight: How Runaway Slaves, Suffragists, Immigrants, Strikers, and Poets Shaped Civil Liberties in California.” He managed development programs for the ACLU of Northern California for 14 years and is the co-editor of two books, “Highway 99: A Literary Journey through California’s Great Central Valley” and “Asian American Literature: An Annotated Bibliography.” His work has appeared in The San Francisco Chronicle, MELUS, Los Angeles Daily Journal, and several anthologies. He is married to nonprofit administrator David Carroll and lives in Los Angeles. Yutaka Houlette (yutakahoulette.com) is a web developer and occasional illustrator based in Oakland. He is currently working at Media Cause, where he is helping to build an activism tool called Rally Starter. “Fred Korematsu Speaks Up” is his most recent illustration project.